Note: For Windows 8 click on the Desktop tile of your Start Screen to following these instructions. In this tutorial we will explain how to setup your Windows computer for recording on SingSnap. When recording on SingSnap all you need to record are your vocals. When saving your recording the SingSnap Mixer will add the music track and allow you to adjust the timing (sync). 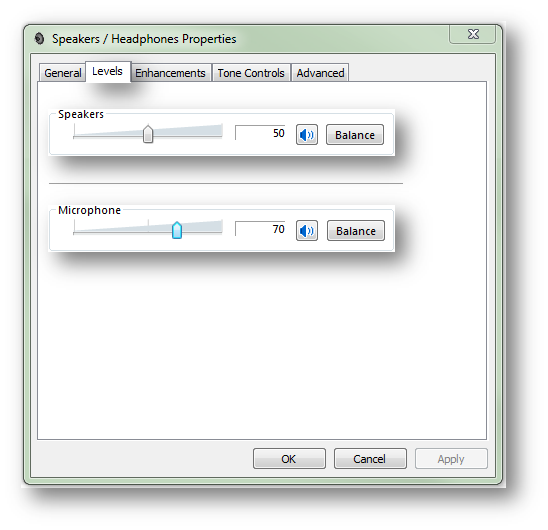 Right click on the speaker icon by your system clock and select "Recording Devices". The Sound window will open to the Recording tab. To show all recording devices right mouse click on the devices area. You will be given the option to Show Disabled Devices and to Show Disconnected Devices. Make sure both of these options are selected (indicated by a check mark). If they are not selected click on the options to select them. Ensure that your Microphone (or the device you wish to record with) is selected as your default device. The default device is shown with a green circle containing a check mark. If your Microphone (or the device you wish to record with) is not set as your default device right mouse click on the device and select "Set as Default Device". Speak into your microphone and ensure the level meter is moving. You should see the level meter move by your default device. If the meter is moving, but not shown as your default device follow the instructions in Step Two to set the device to default. Right mouse click on Microphone (or the device you chose) and select Properties, or double click the device, to open the Properties window. Click on the Levels tab to view the device sound adjustments. Close the Properties and Sounds windows. 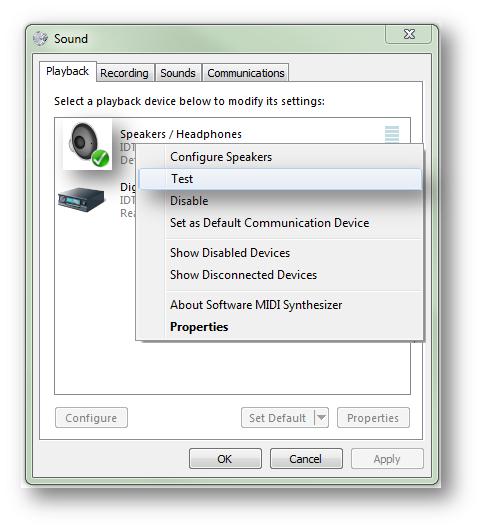 Right click on the speaker icon by your system clock and select "Playback Devices". The Sound window will open to the Playback tab. 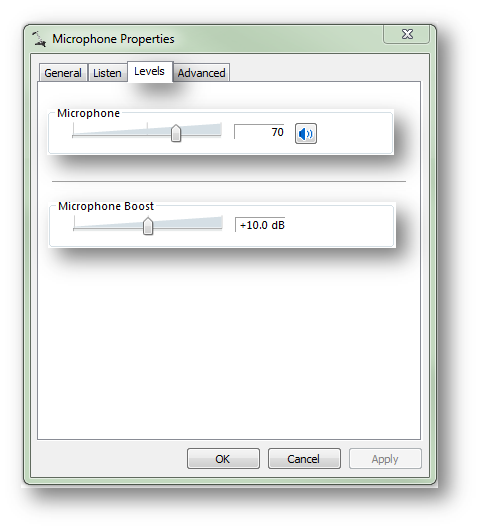 Ensure that Speakers (or the device you use for audio playback) is selected as your default device. The default device is shown with a green circle containing a check mark. 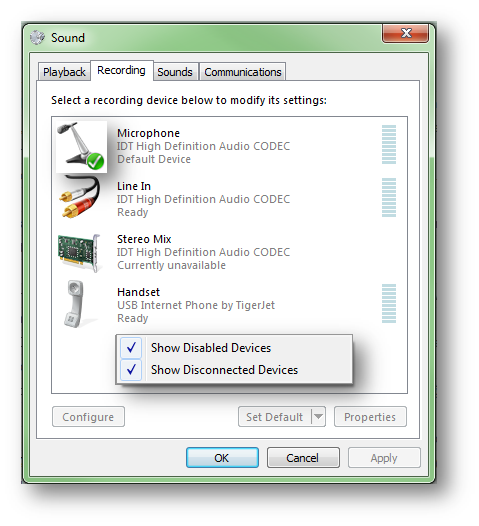 If Speakers (or the device you use for audio playback) is not set as your default device right mouse click on the device and select "Set as Default Device". 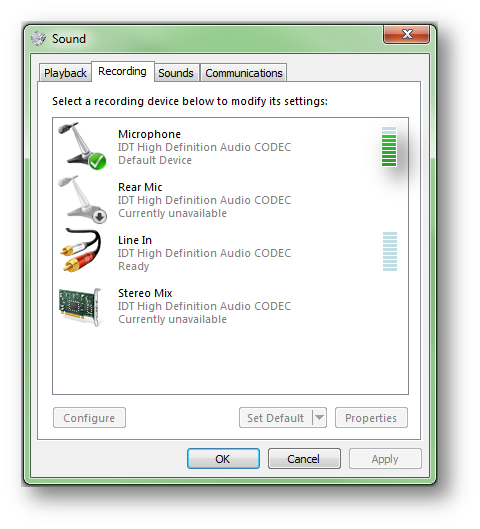 Right mouse click on Speakers (or the device you use for audio playback) and select Test. You should hear sound first from your left speaker and then from the right. Right mouse click on Speakers (or the device you use for audio playback) and select Properties, or double click the device, to open the Properties window. You're ready to Record a Song! To learn how to Record see our New To SingSnap tutorial.